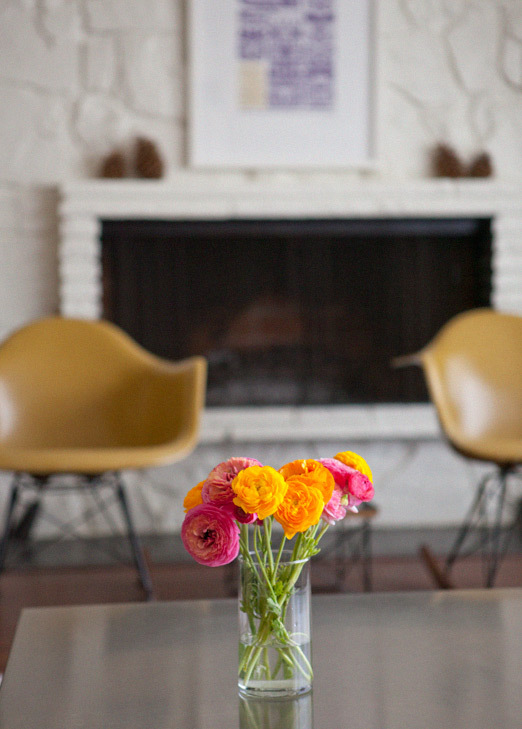 aren’t these ranunculus from the farmers market such a fantastic pop of color in our living room? i forgot how the perfect bunch of flowers can make a whole room feel brand new. now, on to what i’m really itching to talk about…. the division of labor in our house. @ paigey, i still can't get my head around byron katie. is it true? YES! This was an interesting post, just discovered your blog, btw. My husband and I will be married 3 years this summer and we have a 2 year old little boy and a dog. We've sort of (?) divided the labor, in that I do most everything (I'm a stay at home mom) and he mows the lawn (occasionally). However, he did vaccum this weekend, which was wonderful! Can't wait to read more of your blog! Gorgeous photos! We are searching for something different to feed our dog. So what popped out at me was "make the dog food"…what do you make? mj, i make the dogs their food (and i have no scientific evidence of anything, this is just me going on instinct and motherly love alone). vegetables (some lightly steamed, some raw) including carrots, pumpkin, kale, broccoli, cauliflower, green beans and other seasonal veggies. the occasional banana or apple. make sure to research what dogs can have reactions to if you decide to start feeding them this way, if you haven't already! and then they each get a tiny bit of wild fish kibble as well. ( bean gets 1/3 cup, ellie gets half of that). i feed them once a day, in the morning. they LOVE it. bean used to turn her nose up at every meal when i was feeding her just kibble, and i tried every kind with the same result. now she happily scarfs down every last bite! again, this is what i've been feeding them for the past year and i have no formal education about pet nutrition. but they seem really happy and healthy. and i feel better about it than if i were feeding them only kibble (it's so processed, doesn't resemble anything normal to eat so i can't imagine it being that good for them!) i have to go on instinct here, i haven't been able to find a really good definitive guide to dog nutrition that makes sense to me. i love this topic! just relationship stuff in general – it's so fascinating. me and the hubs have lived together for almost 10 years now and still don't have this down. basically the way it goes: the both of us don't really do major cleaning until the crazy cleaning lady bug hits me (usually at odd hours of the day when he's tired). i turn all ocd and have to have things cleaned before i can relax so that's when he turns on cleaning mode as well. we don't really have separate tasks though, except for him cleaning the litter box. at one point we tried clearly defining tasks to do, but that didn't last because we just got on each others case if we weren't keeping up with them. the latest way we're making this work (because who really likes cleaning, washing dishes, scrubbing the toilet, etc), is making saturday morning cleaning time. we make our coffee + breakfast then go at the apartment as a team. we even pump ourselves up by saying, "go team GO!". and it's worked! we're both doing chores at the same time so it doesnt feel like one person isn't doing something, then at the end we look at our place, smile, put on a movie and relax. whew! 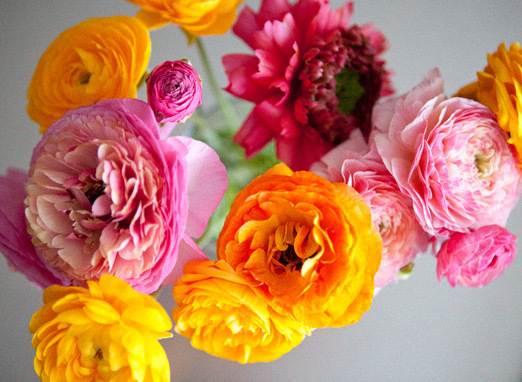 Beautiful flowers!! Love that photo! Yup…division of labor is the answer…..we have a similar set-up. Lou does everything I'd do; and has cleverly managed to avoid doing everything I'd avoid. We've finally found a good groove as well… but I'd still like to snap my fingers and have it done! This is a tough one for us. Matthew isn't the cleanest of em so I end of doing a TON of house work and our place is nowhere near the level of clean I prefer, but we have agreed that he do the dishes and I the laundry. This is a small step but progress, next mission: convince him not to leave his underwear in the living room and other places about the house.